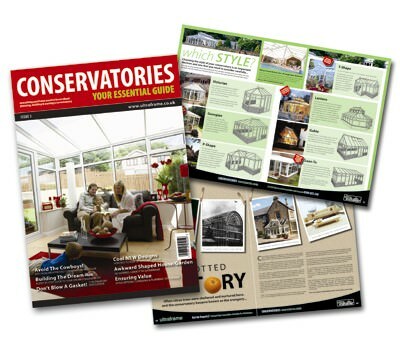 Ultraframe has recently launched issue 5 of their flagship retail brochure, the Essential Guide to Conservatories. Exclusively for use by Ultra Installers, the brochure has been re-vamped to further enhance its feel as a top-end, glossy consumer lifestyle magazine, and guides homeowners right through the conservatory planning process. Topics covered include essentials such as planning permission, choosing a style and glazing options right through to colour schemes and revamping the surrounding garden. Mark Hanson, Marketing Manager at Ultraframe commented: “We believe that equipping our customers with the best tools to do the job is vital. As part of our process of continual improvement, based on customer feedback we have updated the Essential Guide – adding back in some information that had been lost from previous issues and creating a completely new style, which we believe will appeal greatly to consumers. Add in a selection of stunning imagery and strong calls to action about choosing an Ultra Installer and we are confident that the brochure has a winning formula. Members of our Ultra Installer Scheme worked closely with us to develop issue 5 and feedback to what was already a popular item in our literature portfolio so far has been great. We are confident that our customers will welcome the enhancements to what was already a popular item in our literature portfolio. Information from the popular Ultraframe Conservatory Maintenance Guide has also been incorporated into the Essential Guide, to ensure that not only do homeowners know what to consider when choosing a conservatory – but also, how to care for their conservatory once it has been installed. The Ultra Installer Scheme is an elite group of installation companies across the UK who are independently vetted on an ongoing basis by the BBA. For further details about the Scheme visit www.ultraframe.com or call Mark Hanson on 01200 452375.